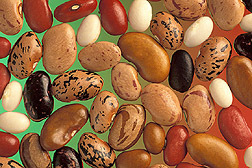 Most people think of dried beans and come up with the familiar four – kidney, navy, pinto and black. But there are a whole lot more varieties of dried beans and some of them have spectacular flavors and very high nutritional value. For my money, Rancho Gordo sells some of the best dried beans available on the market. I don’t normally recommend buying something if I can grow it in my backyard but…there are a couple of reasons I strongly endorse Rancho Gordo. First of all, organically raised, heirlooms like Mayacoba and Good Mother Stollard beans are just a click away from arriving at your front door. Secondly, Rancho Gordo is a small company in California started and run by Steve Sando, a man who knows a whole lot about organic and beans. Another reason I LOVE Rancho Gordo is that Sando’s bean seeds are organically sourced and he works with Seed Savers Exchange. Then there’s the fact that the beans he bags and ships are fresh and so flavorful they actually stand on their own as a main course. Those are all really great reasons to like and recommend a product but here’s one of the strongest reasons of all. The first time I had a problem (the disaster referenced below), I emailed Steve and he actually, personally emailed me back with advice and ideas. The “disaster” started because of one of my growing philosophies. In this age of saving money and eating locally, I decided to try sprouting some of Steve’s lovely beans and growing my own. I made a decision to start my bean plants indoors, from beans I bought from Rancho Gordo. My last frost date is May 15th so I put the seeds in the pots the last week of April – first mistake. The seeds were incredibly quick to break open and start growing. Within 5 days of sprouting, they were a foot tall. It literally took less than a week for the beans to outreach my highest grow light. Here comes the second mistake. I thought about what I should do for a couple of days but when I went back into the basement to check the little dears, I realized I had no choice. I was raising two trays of Seymours from Little Shop of Horrors! I had to transplant them! The third and final mistake. A bit too early and a bit too cool, but I put the small trellis in the soil and put the bean plants in the ground. The next morning, I walked out to the garden to see how they were doing. All but 3 of my 48 bean plants were flat on the ground. Within 24 hours, most of them promptly fell over and died. It was a full-blown, growing disaster so I moved to Plan B. Okay, so starting seeds indoors and transplanting them was an unmitigated disaster. But I don’t give up easily. And since the seeds were so ready to sprout and grow, I thought, why not direct seed? So, I put beans in the ground, watered them and watched them sprout quickly and reach for the netting. They were beautiful plants, sleek, green, growing straight up the supports. Then they were dying. I think they literally drowned. It rained for 5 weeks straight here in Eastern Pennsylvania – way too much water for this crop. When the bean plants that survived the flood (no I did not put them on the Ark and drive them around until the waters receded) finally did dry out, they really tried to finish their jobs and produce beans. The plants set flowers. I got bean pods. But with all the moisture in the air and the soil, the pods promptly got moldy! In desperation, I emailed Steve Sando and asked him if I could still harvest the bean pods if the outsides were speckled and turning black. This wonderful master of all things bean actually emailed me back. Yes, I could but…isn’t there always a but? If the beans themselves were discolored or speckled (unless that’s the way they were born), I had to toss them. Bottom line, I grew more than 100 bean plants; I harvested 1 quart jar of dried beans. And now I just buy my beans at Rancho Gordo because it is a heck of a lot cheaper than trying to raise them! Despite my bean disasters, I did learn a lot about how to plant and grow beans. That’s up, next week. This entry was posted in Gardening Books, Gardening Tips, Organic Gardening and tagged dried beans, growing dried beans, organic dried beans, Rancho Gordo, Seed Savers Exchange, Steve Sando. Bookmark the permalink.